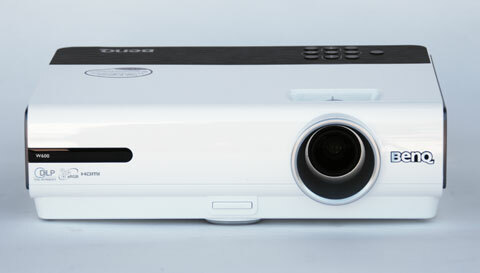 The BenQ W600 is a DLP 720p home entertainment projector with 3D capability. With 2600 lumens of brightness, it has the power to be used in almost any projection environment. Its 3000:1 contrast is great for home entertainment such as video games and television. Its user interface is sometimes difficult to manage, and its limited adjustability will not appeal to those who like to fine-tune their equipment. But with a price of $799 at most retailers, it is a solid value. Light output. The W600 has a highly variable light output that makes it easy to use in almost any projection environment. Dynamic mode, the brightest available, measured 2494 lumens on our test unit, very nearly reaching the projector's specified maximum of 2600 lumens. This mode has a strong green push, but would be appropriate for high-brightness applications such as HD sports in a living room or even "party" video games meant to be played by a large group in a moderately-lit room. Standard mode, the next brightest, has less of a green push than Dynamic along with better color saturation and contrast. Our test sample read 1748 lumens in this mode. If you do not need the extreme brightness of Dynamic mode, Standard mode results in a generally more accurate, better saturated image with better shadow detail. If color accuracy and contrast are your primary concerns, Cinema mode is better still, though lumen output drops to 1320. Using low lamp mode extends lamp life from 2500 hours to 4000 hours, but also decreases brightness by 20%. For the best possible performance with film or video, you will want to disable BrilliantColor, which is enabled by default. BrilliantColor boosts highlights without affecting the rest of the image, leading to a brighter picture with much higher dynamic range. While this sounds like a good thing, it also destroys the sense of balance that you get from a good home theater projector, where the picture feels like an integrated whole. This quality, sometimes difficult to describe but always important, is improved greatly by disabling BrilliantColor. This brings lumen output down to 795 in Cinema mode using high lamp and 636 in Cinema mode using low lamp. Contrast. When using the brighter image modes, the W600 has a very dynamic picture, with brilliant whites and deep blacks - or, at least, it seems that way. In image modes like Cinema, especially with BrilliantColor disabled, dynamic range is reduced but the picture as a whole looks more natural and well-balanced. The actual measured black level does not change; it merely looks less deep in comparison to the less brilliant highlights. Shadow detail is very good - in fact it is better in Cinema than in Dynamic - so you are not losing any information in the projected image itself. The W600's competitors do not fare well with regards to black level either, so in comparison it has a slight edge. Inexpensive Maintenance. The W600 is not just inexpensive at purchase; it is also inexpensive to maintain over time. Lamps last 2,500 hours in High lamp mode or 4,000 hours in Eco mode. Replacement lamps cost only $199 each directly from BenQ. Assume for a moment that the lamp runs for a full 4,000 hours, and the cost per hour is a mere nickel. At 2,500 hours of runtime, it is still only eight cents per hour. And, since there are no filters to replace, lamp changes are the only required maintenance you will ever have to perform. Placement. The W600 has a fixed throw offset of 18%, meaning the bottom edge of the projected image will appear 18% of the image height above the centerline of the lens. In practical terms, a 100" diagonal image would have an offset of just under 9". While this is ideal for a coffee table placement, a ceiling mount might require a drop tube if you have a ceiling fan or other obstruction. The projector has a manual 1.2:1 zoom lens, allowing it to throw a 100" diagonal 16:9 image from 11' to 12' 8". This leeway should allow you some flexibility when mounting the projector, though care must still be taken to plan at least the basics of your installation before purchase. Speaker. The W600 has a 2W mono speaker. This doesn't sound like much (pun fully and completely intended), and indeed volume is rather low. The sound never gets loud enough to cause distortion, which is good, but it also never gets loud enough to be audible to more than about three people, which is not so good. Unless you are sitting very close to the projector in a quiet room, you will need an outboard sound system of some kind. I am trying to decide between these two projectors BenQ W600 and Optma HD66, my primary goal is to project movies, music videos in my back yard after the sun goes down...which one do you think will provide better performance outdoors at night? thank you. I wonder if you can see rainbows in 3D mode. Where searching for a good projector, is BENQ has a good performance than the other brand? 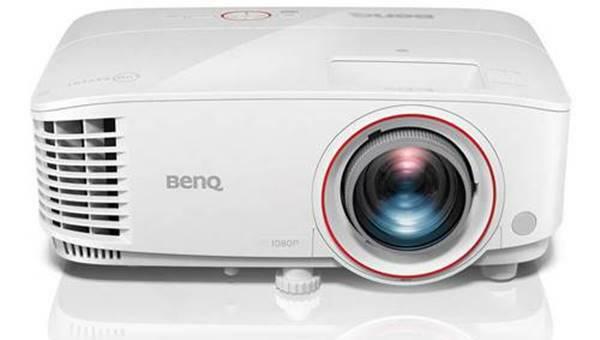 Francisco: For outdoor settings, the BenQ will definitely be the better projector. It has a MUCH brighter image, which I feel would be much better when you are projecting outside, where the light levels will be MUCH LESS controlled. The HD66 is for rooms with little to no light, while the W600 is for situations with much more ambient light. For your specific application, you would get a much better, brighter image with the BenQ. It would enable you to project a bigger image, with plenty of background light in your outdoor setting, as bright as you need. I know I keep talking about "brightness this and that", but for outdoor projecting, that is the single greatest concern. Hope this helps! Thanks Craig. I will order one this week! The monitor settings must be changed to a refresh rate of 120 hz.This will enable the 3d function that is grayed out. I just owned w600+ for a week. To connect with the bluray player or laptop through HDMI, the effect is just acceptable. The color is not vivid, some kind of orange. only blue can be seen naturally. In 10 score max, I　will give 6. I have a Benq w600 and have just purchasd a sony bdp-s470 blu ray 3d player,however when I cannot get the content to play on the projector, the 3D Option on the projector is always grayed out, any advice? You need to add an Optoma 3DXL DLP-Link 3D convertor (and glasses) to your system if you want to be able to display 3D content. A quick Google search will get you to sources and pricing. Expect to pay at least $350-400 for the 3D link and first pair of glasses (sometimes included). Additional glasses can be purchased for about $80-200 apiece. DLP-Link uses the native DLP "white frames" to make the glasses shutter properly for 3D, so you don't have to worry about setting up an IR transmitter. And, yes... these are active glasses. Hi. I know that it is a year since you posted this comment. I have only just connected my W600 to a 3D Blu Ray player. How do I change the monitor refresh rate to 120hz? Solmed: "The monitor settings must be changed to a refresh rate of 120 hz.This will enable the 3d function that is grayed out." Could you please tell me how to change monitor settings? good morning from France, The explanation from BENQ concerning 3D activation is that this feature is only available on PC source. So, even you can provide 120Hz source, BENQ 3D DLP cannot be actived if source is not PC. After paid my calamitous BENQ, I use OPTOMA EX 762, and that's feel good ! very fun ! No error : select OPTOMA for 3D. Just bought the BENQ W600+ because the last model without the + couldnt play 3D. I bought a LG 3D Blueray player but the 3D option on the blueray player is greyed out and the Blueray manual says something about the special LG 3D systemy is mandetary. I will take the Blueray player back to the shop in the morning for a refund- as I explained it was to use with a Benqu 3D projector, but I guess they thought they would try conning me?? the Benq W600+ does not support blueray 3D. no movies available to play in 3D on this projector so don't buy it if you want to watch 3D movies, even though they sell them with active shutter glases! !